The question was put to Quora and a case was made which denied this pretty convicningly..
^Is there any evidence extant that Hitler did in fact propose the peace offer put forth by the film Hitler's Kreig??? Re: Offer to clear Poland? For those interested [seemingly not so] in this very important and central issue (which I find bizarre) in terms of war guilt- I have located the source, first published by David Irving unfortunately in Hitler's War. Hitler's War was a reliable source but is now problematic to cite since his "downfall" if you interpret it that way. It's important because the German offer to withdraw from Poland renders absurd the notion of Lebensraum meaning "wiping out the Slav's/Russian's" for obvious reasons. It's definitely not that simple. We're here talking about the offer to clear Poland- AFTER she was defeated at the end of September, early November. The liars don't dispute that, they dispute the notion that Hitler offered to clear his beaten half of Poland, sans Danzig and the corridor once Warsaw was defeated militarily, and the allies refused- thus toppling the liars notion of "lebensraum" in the East, and starkly highlighting the warmonger nature of the Western enemies. 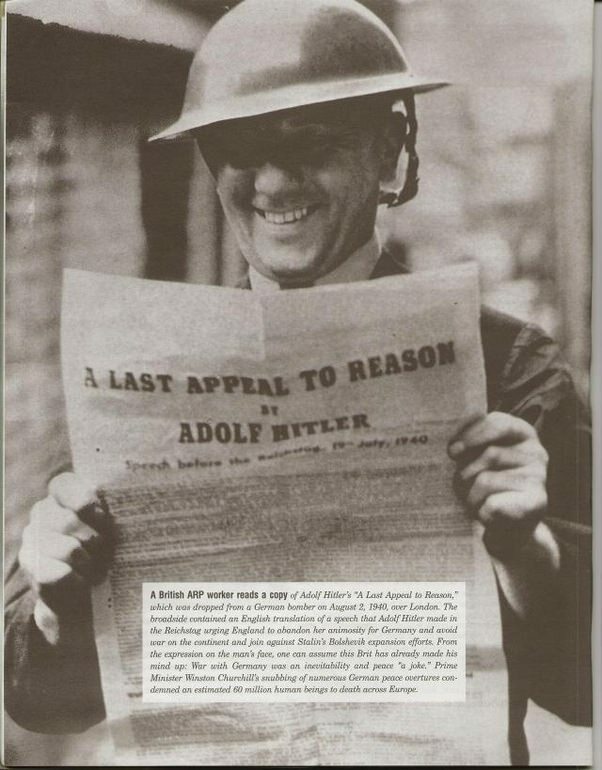 This 16 points of peace with Poland was Hitler's final pledge before hostilites issued just before and printed in this newspaper on Sep 1st right after they'd broken out. This is certainly not the same thing at all. OK, it's a fragment and one needs to consider those, when looking at what you are looking for. But how about this speech? That is true of course. It's necessary to consider the entire month of September and the August and October before and after and developments of the Polish question which is of course how revisionist historian's have done it. The Dahlerus clincher should be more accessible as these behind the scenes machinations are equally important for what went on here as are official public discourse. With regards to the October 6th German peace offer, here is the transcript in English. What then are the aims of the Reich Government as regards the adjustment of conditions within the territory to the west of the German-Soviet line of demarcation which has been recognized as Germany's sphere of influence? First, the creation of a Reich frontier which, as has already been emphasized, shall be in accordance with existing historical, ethnographical and economic conditions. Second, the disposition of the entire living space according to the various nationalities; that is to say, the solution of the problems affecting the minorities which concern not only this area but nearly all the States in the Southwest of Europe. Fourth, reconstruction of transport facilities and economic life in the interest of all those living in this area. Sixth, formation of a Polish State so constituted and governed as to prevent its becoming once again either a hotbed of anti-German activity or a center of intrigue against Germany and Russia. In addition to this, an attempt must immediately be made to wipe out or at least to mitigate the ill effects of war; that is to say, the adoption of practical measures for alleviation of the terrible distress prevailing there. This "Offer to clear Poland" question seems to be resolved. Hitler was willing to withdraw from Poland under an obviously justified conditional agreement. The British and the French refused. Thus proving that the object was not to defend Poland at all- but to initiate war against Germany. It also demonstrates the absurdity of the mainstream view of the German war for lebensraum in the East and a design for Hitler to winningly attack the Soviet Union in a war of genocide and conquest a year and a half later. A further lead.. The film "Hitler's Krieg- What the Historian's Neglect to Mention" is based mostly on the book "The War with Many Father's" by Gerd Schultze-Rhonof. This book is endorsed by CODOH, and therefore should be near 100% honourable to factual truth. I have not yet reviewed this book. I will indulge after my current volume and report further findings if available on a more reliable source than Irving here for all others to help all to combat the most important issues regarding the world's biggest lie. Please jump in if anyone else can cite this evidence first. I have another source for you. Hesse-Hewel: HH 84–85; Hesse, Das Spiel, Chap. 4; interview with Hesse, 1970. Early in September Göring had hinted to the British through Birger Dahlerus that Germany would be willing to restore sovereignty to a Poland shorn of the old German provinces excised from the Fatherland at the end of the Great War; there would also be a reduction in German armaments. If this is the right one let me know, if you could also provide a page number for the note you found I'd appreciate it. Hitler was ready to conquer Europe. But, it was a little late in the game. Then I came across a reference to the 6 October 1939 speech in M.S. King's 'The Bad War', which Amazon has de-listed by the way along with the holohoax books, and this thread has provided not one but two smoking guns, the relevant parts of the transcript of the speech and the Toland reference. The account of the holohoax in the book is also complete BS, and I'll also send in a report on that. I had some success correcting my kids middle school history text, I submitted 3 errors and they corrected (sort of) each of them, one had to do with Eisenhower liberating death camps, another was "Hitler had no interest in avoiding war". I'm sure if you have any secondary school history text you will find blatant errors in the treatment of WW II, and from what I've seen the publishers have formal procedures when someone submits a correction. I recommend it.